The Sultan of Johor, Sultan Ibrahim ibni Almarhum Sultan Iskandar, today launched a refinery and petrochemical integrated development (RAPID) project in Pengerang and advised detractors to change their mind lest the people there be denied development. 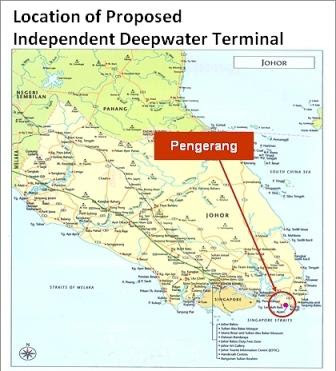 He expressed sadness that a small group of people was opposed to the Petronas project and was trying to instigate others to stage protests and make unreasonable demands. Prime Minister Datuk Seri Najib Tun Razak, Johor Menteri Besar Datuk Abdul Ghani Othman and Petronas president and CEO Datuk Shamsul Azhar Abbas were also present at the event. Sultan Ibrahim said the selection of Pengerang as an oil and gas industry hub was a blessing for Johor because the state and its people would stand to benefit from the large investments pouring in. The RAPID development would also open up jobs and businesses which would help raise the living standard of the people, he said. The older people would be happy that their children and grandchildren would be able to secure employment in Pengerang itself and not have to find jobs elsewhere, he added. The sultan said he had been informed that due compensation would be paid for the property acquired for the development of the project, and advised the people not to make unreasonable demands. Sultan Ibrahim said the government and related parties should exercise fairness in resolving the problems associated with the people, adding that he would make regular trips to Pengerang to ensure that the project progressed as planned. RAPID, which involves an investment of RM60 billion, will have the capacity to refine 300,000 barrels of imported crude oil and would offer 4,000 permanent jobs. Abdul Ghani, in his speech, said the quantum of compensation for the affected people would be announced in October at the latest. "The government realises that the matter of compensation is uppermost in the minds of the people. We hope that they will be patient and wait for the announcement," he said. Abdul Ghani gave the undertaking that the state government would ensure that the people derived the best benefit from the implementation of the project. He said the affected people would be relocated in stages, with the first batch set to move in March next year from three villages, namely Sungai Kapal, Teluk Empang and Langkah Baik. Abdul Ghani said he was convinced the project would be a catalyst for the development of various oil and gas support industries which would provide local companies the opportunity to interact with international oil and petrochemical companies expected to participate in the project. This would help raise the level of skills, knowledge and capability of the local companies in the fields of engineering, procurement or technical installation, he said. Shamsul, in his speech, said RAPID symbolised the determination of Petronas to develop its downstream transactions and consolidate further the company's capacity to compete in the petroleum and petrochemical products market in the Asian region.